The Cao Dai Great Temple at the sect’s Holy See is one of Asia’s most unusual and astonishing structures. Built between 1933 and 1955, the temple is a rococo extravaganza blending the dissonant architectural motifs of a French church, a Chinese temple and an Islamic mosque. 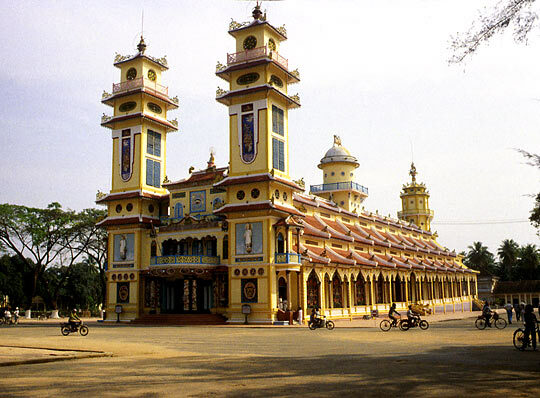 Because of the once-vaunted political and military power of the Cao Dai, this region was the scene of prolonged and heavy fighting during the Franco-Viet Minh War. Tay Ninh province served as a major terminus of the Ho Chi Minh Trail during the American War, and in 1969 the Viet Cong captured Tay Ninh town and held it for several days. During the period of conflict between Cambodia and Vietnam in the late 1970s, the Khmer Rouge launched a number of cross-border raids into Tay Ninh province and committed atrocities against civilians. Several cemeteries around Tay Ninh are stark reminders of these events. Home to the Cao Dai Great Temple (Thanh That Cao Dai), the Cao Dai Holy See, founded in 1926, is 4km east of Tay Ninh, in the village of Long Hoa. As well as the Great Temple, the complex houses administrative offices, residences for officials and adepts, and a hospital of traditional Vietnamese herbal medicine that attracts people from all over the south for its treatments. After reunification the government took parts of the complex for its own use (and perhaps to keep an eye on the sect). Prayers are conducted four times daily in the Great Temple (suspended during Tet). It’s worth visiting during prayer sessions (the one at noon is most popular with tour groups from HCMC) but don’t disturb the worshippers. Only a few hundred adherents, dressed in splendid garments, participate in weekday prayers but during festivals several thousand may attend. The Cao Dai clergy have no objection to visitors photographing temple objects, but do not photograph people without their permission, which is seldom granted. However, it is possible to photograph the prayer sessions from the upstairs balcony, an apparent concession to the troops of tourists who come here daily. It’s important that guests wear modest and respectful attire inside the temple, which means no shorts or sleeveless T-shirts. Set above the front portico of the Great Temple is the divine eye. Lay women enter the Great Temple through a door at the base of the tower on the left. Once inside they walk around the outside of the colonnaded hall in a clockwise direction. Men enter on the right and walk around the hall in an anti clockwise direction. Hats must be removed upon entering the building. The area in the centre of the sanctuary is reserved for Cao Dai priests. A mural in the front entry hall depicts the three signatories of the ‘Third Alliance between God and Man’: the Chinese statesman and revolutionary leader Dr Sun Yat-sen (Sun Zhongshan; 1866–1925) holds an ink stone, while the Vietnamese poet Nguyen Binh Khiem (1492–1587) and French poet and author Victor Hugo (1802–85) write ‘God and humanity’ and ‘Love and justice’ in Chinese and French (Nguyen Binh Khiem writes with a brush, Victor Hugo uses a quill pen). Nearby signs in English, French and German each give a slightly different version of the fundamentals of Cao Daism. The main hall is divided into nine sections by shallow steps, representing the nine steps to heaven, with each level marked by a pair of columns. Worshippers attain each new level depending on their years as Cao Dai adherents. At the far end of the sanctuary, eight plaster columns entwined with multicoloured dragons support a dome representing the heavens. Under the dome is a giant star-speckled blue globe with the ‘divine eye’ on it. The largest of the seven chairs in front of the globe is reserved for the Cao Dai pope, a position that has remained vacant since 1933. The next three chairs are for the three men responsible for the religion’s law books. The remaining chairs are for the leaders of the three branches of Cao Daism, represented by the colours yellow, blue and red. (Black Lady Mountain; adult/child 10,000/5000d chairlift one way/return adult 50,000/90,000d, child 30,000/50,000d) Fifteen kilometres northeast of Tay Ninh, Nui Ba Den rises 850m above the rice paddies, corn, cassava (manioc) and rubber plantations of the surrounding countryside. Over the centuries it has served as a shrine for various peoples of the area, including the Khmer, Cham, Vietnamese and Chinese, and there are several interesting cave temples here. Several stories surround the name ‘Black Lady Mountain’. One is derived from the legend of Huong, a young woman who married her true love despite the advances of a wealthy Mandarin. While her husband was away doing military service, she would visit a magical statue of Buddha at the mountain’s summit. One day Huong was attacked by kidnappers but, preferring death to dishonour, she threw herself off a cliff. She then reappeared in the visions of a monk who lived on the mountain, and he told her story. The hike from the base of the mountain to the main temple complex and back takes about 1½ hours. Although steep in parts, it’s not a difficult walk – plenty of older pilgrims in sandals make the journey to worship at the temple. Around the temple complex are a few stands selling snacks and drinks. If you need more exercise, a walk to the summit and back takes about six hours. The fastest, easiest way is via the chairlift that shuttles the pilgrims up and down the hill. For a more exhilarating descent, try the ‘slideway’, a sort of winding track that drops 1700m around the mountain and is the closest thing to the luge in Vietnam. Tay Ninh is on Hwy 22 (Quoc Lo 22), 96km from HCMC. The road passes through Trang Bang, the place where the famous photograph of a severely burnt young girl, Kim Phuc, screaming and running, was taken during a napalm attack in the American War. Read more about her story in The Girl in the Picture (1999) by Denise Chong. Buses from HCMC to Tay Ninh leave from the An Suong bus station (minibus 50,000d), but by far the easiest way to get here is by one of the Tay Ninh/Cu Chi tours leaving from District 1. You could consider leaving one of the cheaper tours (US$7) at the Holy See. A taxi from here to Nui Ba Dem costs around 100,000d, while a xe om should only be around 40,000d. It would then cost a similar amount to return to the bus station in Tay Ninh town.